The Department of Computer Science and Engineering, School of Computing, Vel Tech Rangarajan Dr. Sagunthala R&D Institute of Science and Technology, Avadi, Chennai-600062, India is poised to organize the International Conference on “International Conference on Artificial Intelligence Techniques for IoT Data Analytics Applications (AIIoTDA 2020) under the aegis of Springer during 26 – 28, March 2020 in its campus. Vel Tech offers programmes in Engineering, Management, Media and Law. The Institution has made distinctive progress since the founding in 1997, by adopting the unique and trending educational methodologies. Vel Tech is the first member from India to adopt Conceive-Design-Implement-Operate (CDIO), CDIO is a worldwide framework which aims to produce the next generation engineers. The CDIO based academic process undoubtedly generates knowledgeable up-skilled graduates with a professional attitude who are industry ready. Vel Tech has been recognised as the Best Engineering Institution and ranked as First in India and 74th in the world by Times Higher Education World Young University Ranking 2016-2017 and 43rd in Asia by Times Higher Education Asia University Ranking 2017. The TBI(Technology Business Incubator) of Vel Tech is recognized as the Centre of Excellence under NIDHI by the Government of India. For more details visit www.veltech.edu. 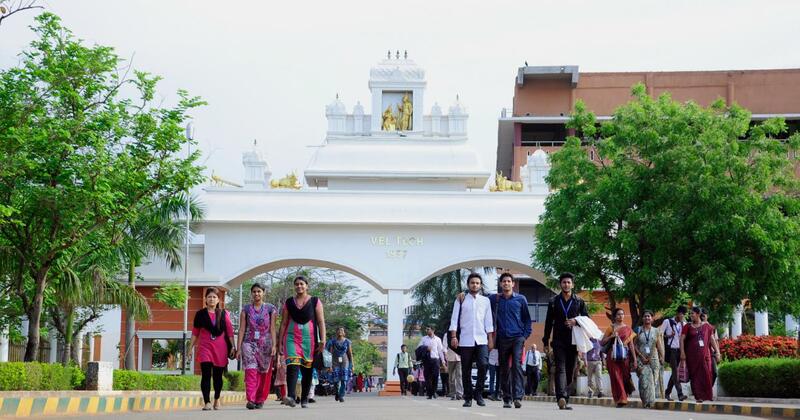 One of the largest Schools in the University with state-of-the-art laboratories from all the domains of Computer Science and Engineering (CSE), and Information Technology (IT). The School of Computing (SoC) possesses an excellent record in organizing seminars, workshops, symposia and conferences in emerging areas of CSE and IT. IEEE International Conference on Smart Technologies and Management for Computing, Communication, Controls, Energy and Materials in 2015 under the ageis of IEEE and DRDO. The papers presented were published in IEEE Xplore, IEEE CS Digital Library and indexed by SCOPUS. IEEE International Conference on Smart Technologies and Management for Computing, Communication, Controls, Energy and Materials in 2017 under the ageis of IEEE. The papers presented were published in IEEE Xplore, IEEE CS Digital Library and indexed by SCOPUS. To bring together highly accomplished researchers and practitioners in order to hear and share the latest trends and transitions happening in the strategically sound fields of interests. The key technological domains include artificial intelligence (AI) (Machine and deep learning algorithms, computer vision, natural language processing, etc. ), the Internet of Things (IoT), real-time analytics, etc. The business domains include almost everything from healthcare, retail, smart cities, supply chain and logistics, utility, avionics and automotive electronics, banking, insurance and other financial domains, governments, etc. It is all about collecting and collating together top-quality research papers to articulate and accentuate the latest improvements and improvisations in the AI and IoT technology spaces. With the faster maturity and stability of the Internet of Things (IoT) technologies and tools, a variety of industry verticals areseriously strategizing and implementing IoT devices to embrace them for bringing forth decisive and deeper automation in their everyday operations. The artificial intelligence (AI) paradigm is another pioneering one capturing a lot of mind and market shares these days. The business behemoths are consistently leveraging the distinct advancements being accomplished in the IoT and AI spacesto realise the digital innovation, disruption and transformation goals. In this conference, we would like to pick and publish the papers that focus on the versatile techniques and tools for simplifying and streamlining the realization of IoT analytics and applications across various business disciplines. Further on, there are collaborative initiatives and efforts to use themesmerizing blockchain technology and cryptographic anchors for ensuring the unbreakable and impenetrable security and safety not only for billions of IoT devices and for multi-structured and massive IoT interaction/transaction/operation/analyticsdata. The papers specialising on the aspect of the IoT security, being the utmost concern of commoners as well as IoT product, solution and service providers, will be asked from worldwide researchers and astutely reviewed to be published through the conference proceedings. Precisely speaking, this conference seeks and solicits high-quality papers on various methods for accelerating IoT data analytics accomplished in cloud servers and fog device clusters for extricating actionable and timely insights. The software services, solutions and systems are mandated to be cognitive in their operations and outputs. Thus, there is a need for fusion of a bevy of potential, promising and proven technologies. Vel Tech Rangarajan Dr.Sagunthala R&D Institute of Science and Technology, Chennai. Reliance Jio Infocomm. Ltd. (RJIL), Bangalore, India. Fu Jen Catholic University, Taiwan. National Institute of Technology, Rourkela, Odhisha, India. Motilal Nehru National Institute of Technology, Allahabad, Uttar Pradesh, India. Indian Institute of Technology, Guwahati, Assam, India. Oakland University, Rochester, MI 48309, USA. University of Wisconsin-La Crosse, La Crosse, WI 54601, USA. University College Dublin (UCD), Dublin 4, Ireland. AlBalqa’ Applied University, Salt 19117, Jordan. Keene State College, Keene 03435, USA. King Abdulaziz University Jeddah, Saudi Arabia. Mount Royal University, Alberta ,Canada. Otto-von-Guericke-Universitaet Postfach 4120, D-39016 Magdeburg, Germany. North Carolina A & T State University, USA. Alexander Technological Educational Institute of Thessaloniki, Greece. University of Southern Mississippi-Gulf Park Campus, USA. Jamia Millia Islamia, New Delhi, India. Pondicherry Engg. College, Pondicherry, India. Aligarh Muslim University, Uttar Pradesh, India. Central University of Kerala, Kerala, India. Central University of Jammu, Jammu and Kashmir, India. Dr. Hari Singh Gour University, Madhya Pradesh, Sagar, India. Central University of Tamil Nadu, Tamil Nadu, India. Hemwati Nandan Bahuguna Garhwal University, Uttarakhand, India. Central University of Punjab, Bathinda, Punjab, India. Indian Institute of Information Technology, Pune, India. Indian Institute of Information Technology, Dharwad, India. Indian Institute of Information Technology, Tiruchirapalli, India. Atal Bihari Vajpayee Indian Institute of Information Technology and Management, Gwalior, India. South Asian University, Delhi, India. Visva-Bharati University, West Bengal, India. University of Hyderabad, Telangana, India. Mahatma Gandhi Central University, Bihar, India. Asst. Prof, Dept. of CSE, Pondicherry University, Puducherry, India. Carleton University, Ottawa, Ontario, K1S 5B6, Canada. Indian Institute of Information Technology, Sri City, Chittoor, A.P, India. Southern Taiwan University of Science and Technology (STUST), Taiwan. University of Bedfordshire, United Kingdom. Indira Gandhi National Open University, Delhi, India. National Institute of Technology, Hamirpur, Himachal Pradesh, India. AIIoTDA 2020 still invites reviewers and hence the number of reviewers will be increased on par with the papers received. Dr N Gomathi, Prof., Dept. of CSE, VT, Chennai. Dr R Suguna, Prof., Dept. of CSE, VT, Chennai. Dr P Balamurugan, Prof., Dept. of CSE, VT, Chennai. Dr M Kavitha, Asso. Prof., Dept. of CSE, VT, Chennai. Dr T Senthil Murugan, Asso. Prof., Dept. of CSE, VT, Chennai. Dr R Kavitha, Asso. Prof., Dept. of CSE, VT, Chennai. Dr M J Carmel Mary Belinda, Asso. Prof., Dept. of CSE, VT, Chennai. Dr K Arthi, Asso. Prof., Dept. of CSE, VT, Chennai. Dr K Meena, Asso. Prof., Dept. of CSE, VT, Chennai. Dr M Shyamala Devi, Asso. Prof., Dept. of CSE, VT, Chennai. Dr N Partheeban, Asso. Prof., Dept. of CSE, VT, Chennai. Dr G R Kanagachidambaresan, Asso. Prof., Dept. of CSE, VT, Chennai. Dr C Amuthadevi, Asso. Prof., Dept. of CSE, VT, Chennai. Dr A Srinivasan, Asso. Prof., Dept. of CSE, VT, Chennai. Dr S P Raja, Asso. Prof., Dept. of CSE, VT, Chennai. Dr N R Rajalakshmi, Asso. Prof., Dept. of CSE, VT, Chennai. Dr R Rajkumar, Asst. Prof., Dept. of CSE, VT, Chennai. Dr V Vanitha, Asst. Prof., Dept. of CSE, VT, Chennai. Dr J Santhosh, Asst. Prof., Dept. of CSE, VT, Chennai. Dr G M Karpuradheepan, Asst. Prof., Dept. of CSE, VT, Chennai. Dr V Dhilip Kumar, Asst. Prof., Dept. of CSE, VT, Chennai. Dr G ArulKumaran, Asst. Prof., Dept. of CSE, VT, Chennai. Mr. S. Alex David, Asso. Prof., Dept. of CSE, VT, Chennai. Mr. K. Kishore Kumar, Asst. Prof., Dept. of CSE, VT, Chennai. Mr. D. Manivannan, Asst. Prof., Dept. of CSE, VT, Chennai. Mr. N. K. Manikandan, Asst. Prof., Dept. of CSE, VT, Chennai. Mr. K. Antony Kumar, Asst. Prof., Dept. of CSE, VT, Chennai. Mr. S. Ravikumar, Asst. Prof., Dept. of CSE, VT, Chennai. Mr. S. Durai, Asst. Prof., Dept. of CSE, VT, Chennai. Ms. Almas Begum, Asst. Prof., Dept. of CSE, VT, Chennai. Ms. D. Hemalatha, Asst. Prof., Dept. of CSE, VT, Chennai. The Springer’s Communications in Computer and Information Science (CCIS) series is devoted to the publication of proceedings of computer science conferences. Its aim is to efficiently disseminate original research results in informatics in printed and electronic form. The focus is on publication of peer-reviewed full papers presenting mature work.